Physical development is how your baby continues to grow and gain weight. Cognitive development is how your baby's brain starts to learn, remember, and recognize people. Emotional and social development starts with how your baby bonds with you and other caregivers. Most babies start to interact with others and show emotions. Language development is how your baby first communicates with different cries. Then your baby starts to babble. By 12 months, your baby may be able to say a few words. Sensory and motor development is the way your baby starts to control how he or she moves. In the first year, babies become strong enough to sit. Some babies stand. Others take their first steps. If your child has a delay in one area, it may not mean there is a problem. It is common for a baby to be ahead in one area and a little behind in another. 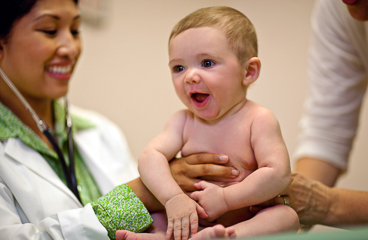 But it is important to talk to your doctor if you have concerns about your baby's development. If you find problems or delays early, you'll have the best chance of treating them. There are lots of ways you can help your baby's development. Start with simple things like loving and holding your baby. Talk to and feed your baby, and change his or her diapers. Place your baby on his or her tummy to play while he or she is awake and you are closely watching. Play with your baby. Let your baby be curious and safely explore, but set limits. You may need to redirect your baby's attention. For example, if your baby tries to pull the dog's tail, show your baby a toy and move the dog to another area. Respond to your baby's cries. Crying is your baby's way to tell you that he or she is hungry or uncomfortable. You are not spoiling your baby by quickly responding to his or her needs. Make a lot of eye contact with your baby. You can do this when you feed your baby. You can also play games like peekaboo. Talk to your baby often. Use "baby talk." The higher pitch, slower speech, and emphasis on certain words help get your baby's attention. Read, smile, sing, and play music for your baby. Show your baby new and interesting things. Point out pictures in your home. Go for walks outside. Talk about the things you see. Offer your baby new words. Try words like "baby," "cat," "dog," "go," "hot," and "cold." Give your baby different toys to play with often. Any household object, like a spoon, can be a toy. But be careful not to give anything that could hurt your baby or that he or she could swallow. Your child has lost a skill that he or she used to have, such as crawling. You have concerns about your child's vision or hearing. You have concerns about your baby's development. Enter E687 in the search box to learn more about "Stimulating Your Baby's Development: Care Instructions".